The memory to store a particular structure or object is split into blocks of determined size. This size is called alignment. The C++ standard requires that members are stored in memory in the order of declaration. Multiple consecutive members can be “packed” in one block. If the next member doesn’t fit into the remained bytes of the block, it’s saved into the following block. Those unused bytes in the previous block are called “padding”. Normally the alignment is determined by the compiler for each structure type. In a simple scenario where the structure doesn’t contain other structures, the alignment is the size of the largest type stored in the structure. However, in some environments a simple type can have alignment requirement that is smaller than the size of the type. For example double can have alignment of 4. So it would be better to say that alignment of a structure is the maximum alignment of its contained types. Alignment is only allowed to be power of two by the standard. cd is the special value used for padding in this case (compiled in debug configuration). (Note that 03 is the first byte of the integer indicating that we see little endian – http://en.wikipedia.org/wiki/Endianness). Alignments of the types are the following: int 4, double 8, short 2. The maximum is 8 so the alignment of the structure is 8. Note: 00 00 00 00 00 00 00 04 is how the double value of 2 is represented in memory. We only need 14 bytes to store Alignment8 but it takes 24. The order of the members is the problem. The block is 8 bytes and when we pack d, it has to start from the next block as there is only 4 bytes left in the current block, which is not enough for d. i and s can fit into one block but they are separated by d. BetterAlignment8 (see below) takes only 16 bytes. This will reduce the memory consumption and possibly improve the performance as more elements will fit into the CPU cache. Across the project /ZpN where N can be 1, 2, 4, 8, 16. Specify alignment within code range of a module. In this example the alignment of Size7 and Size5 will be 1. Specify alignment per structure type. You can even control alignment per member http://msdn.microsoft.com/en-us/library/83ythb65.aspx. In Visual Studio 2012 if you specify alignment that the compiler doesn’t accept in a particular case, it will be ignored without a warning. Everything below also has effect in Visual Studio 2012. // default alignment is 4. If default_alignment > pragma_alignment, pragma is ignored. __declspec instruction is opposite to #pragma. It is ignored if the alignment is less than the default alignment. If you have specific requirements for the alignment in your piece of code and you don’t know how it will be compiled in the future, it’s always better to assert it in the code. C++11 or TR1 are required. If the alignment is not 4, there will be a compilation error. However, it doesn’t always happen. If you return a variable from another module by reference or pointer, there will be no warnings. If the system you are working on demands high performance or low memory consumption, you may want to change the default alignment. It should be measured and tested of course. Sometimes you have to deal with alignment even when you don’t expect. 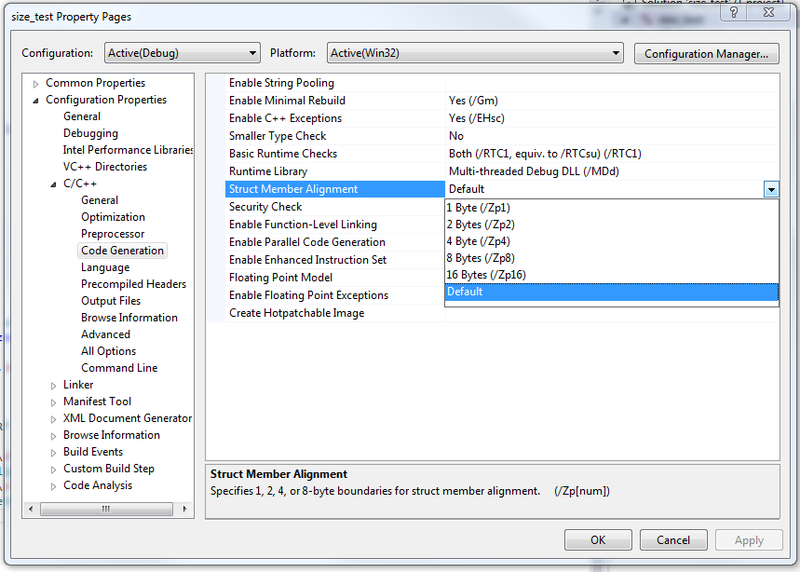 For example the Microsoft code generator for COM proxies inserts alignment control directives. It can cause issues that you need to be prepared to understand. So alignment is worth keeping an eye on.